Done right, marketing automation can help B2B companies meet and exceed all goals. But how do you do it right when marketing automation is daunting? 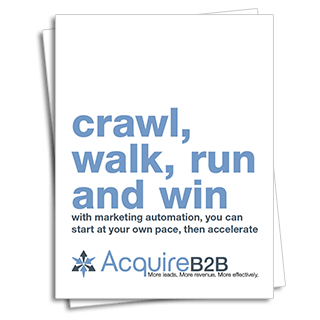 You use a Crawl, Walk, Run, Win approach to build effective marketing automation campaigns – a ten-step process divided into four stages that makes it much easier to get started in running advanced, well-organized and automated campaigns. Get your copy of Crawl, walk, run and win by completing and submitting the form, and then your complimentary copy will download within seconds. You’ll start reeling in more qualified, sales-ready leads and higher financial rewards in no time.